One week past my due date. 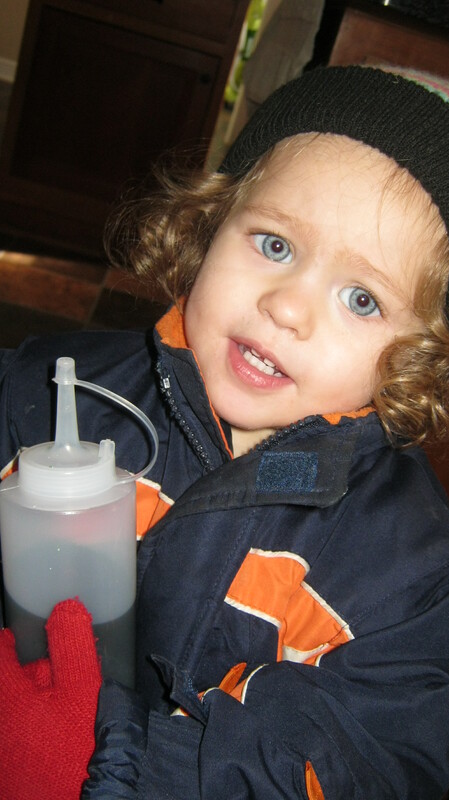 Feeling ENORMOUSLY “with child.” Hormones taking emotions for spontaneous, tear-filled, whirlwind adventures. Contractions that don’t seem to be doing any good other than rendering me nearly paralyzed for half a minute. And STILL You want me to be patient, God? Are You kidding?! I know these are legitimate reasons for being extra tired and emotional. They are not, however, good excuses for a bad attitude. I looked up “waiting” in the little section at the back of my Bible and read some of the verses listed. You know what I noticed? When the waiting is dependent on God, it is filled with blessing. These are just a few of the verses I found. What I noticed was the absolute dependence on God. Oh how I identify with the phrase “my whole being waits!” It does indeed! But am I putting my hope in Him? Not especially. I’ve been too busy complaining at Him over the timing of a couple weeks. As my midwife said, this baby WILL come out. There’s no other option. 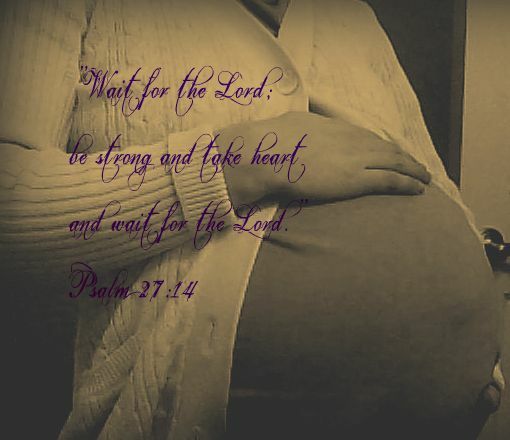 It would be impossible for me to remain pregnant! And yet here I’ve been, moping and crying out in frustration when I could be learning about the hope found in God, the confidence found in His faithfulness, the trust found in His love. I’m grateful He never gives up on teaching me. It’s still an internal struggle to wrap my mind around it, but the truth is waiting on the Lord is good. This is a lesson that must become rooted deep, deep in my heart. I will have many opportunities to exercise waiting and not all of them will be as straight-forward as the birth of my beautiful baby. Surprisingly, I did actually stumble across something I’d like to say. When I look at my life, I usually end up feeling bemused and baffled. I have a lot going on but I’m always a little surprised by what those things are. Look, if I had a portal into the future at age 16 and I was able to look at my life now at age 27, I probably would have taken a hammer to said portal in order to fix it because obviously it must’ve gone haywire. At 16, I didn’t know what life held for me but I had hopes. I pictured working hard at a 4-year university, maybe finding a lead into writing for a semi-popular magazine, searching for a job in journalism, possibly traveling a lot or at least moving away for awhile. Then I pictured finding time to pen a novel or biography, gaining enough notoriety to at least justify some speaking engagements and book signings. I wondered how getting married sometime would fit into all that, but I didn’t worry about it much. I thirsted for romance but not after settling into the role of wife. I didn’t even think about being a mother. My vision of my future was all watercolors of busy cities, pencil skirts and heels, piles of papers, and hurrying from one deadline to another. It was a nice, general picture of interests that I knew could sustain me through my adult life. It happened to be pretty much dead wrong. Here’s what really happened: met a guy and started courting shortly before I turned 17, accepted his proposal of marriage at age 18, married at 19, spent one year in college as a married couple and then went back home (husband’s in-the-country hometown) when the bills got too steep. Spent another year in an apartment, became pregnant with our first child, bought a house. Had baby #1, became pregnant with baby #2, spiraled into an identity-crisis because of truly deplorable lack of skill at housekeeping and feeling generally overwhelmed. Husband’s employer bankrupt, house fire, baby #2, bought minivan, adjusted attitude and settled into the struggle with housekeeping. Father diagnosed with terminal brain cancer, husband found excellent employer, pregnant with baby #3, discover amazing midwife and plan first homebirth. Said final goodbye to father, baby #3 born at home in my room, a blur of two years of intense grief and challenging God in every way. God broke my heart of stone, spent a lot of time re-learning how to love and be loved, began reading up on different methods of homeschool, pregnant with baby #4. My mother remarried, baby #4 born at home, homeschool adventures begin, get adjusted, begin again. Husband’s family goes through one of the toughest years yet, pregnant with baby #5, admitted to myself that I am technically more of an unschooler than a traditional homeschooler, begin to accept always being a little different than the crowd I find myself in. The most shocking part, to me, is how very blessed and grateful I am for every one of those surprises. Yes, every single one. Right down to the bankrupt employer, the house fire, and the Daddy I can no longer call when I’m having a rough day. It’s been tough, it’s been fast, but it’s been incredibly fruitful. Losing his job gave my husband the opportunity to find a better one. Our house provided a job for my husband during reconstruction and is now much more suited to our needs. And my dad? I’ve learned more about God and His goodness than I ever could have another way. I still feel a little like my current life doesn’t do a very good job of representing who I am to other people. But I suppose it’s fitting that in a life full of ridiculous, even shocking, surprises that I should be a bit of a surprise myself. When I got up this morning–or rather, when I creaked my way, stage by stage, out of my bedroom and into the land of the living, I did not want to do ANYthing. It was one of those days. I hadn’t slept well, the kids seemed far too full of energy, Eric had some constructive criticism to offer, and “have a good day” seemed like an insult to my intelligence. I gathered myself enough to call a friend and pray before things got really bad. I stopped growling at everyone in the house and eventually, after many distractions, made a to-do list. I like making lists. I don’t find it particularly helpful, but I enjoy it as a form of brainstorming. I wrote today’s list in pink pen, graffiti style. First, I doodled all the things I wanted to do. Then, I dutifully copied down all the things I could do to be productive. My next move was to stare at my list for a while. I liked the pink color. Doodling could’ve been better, though. Then I edited the productive side, labeling with stars the ones which required some extra help to accomplish. Stared some more. And then I took a shower. 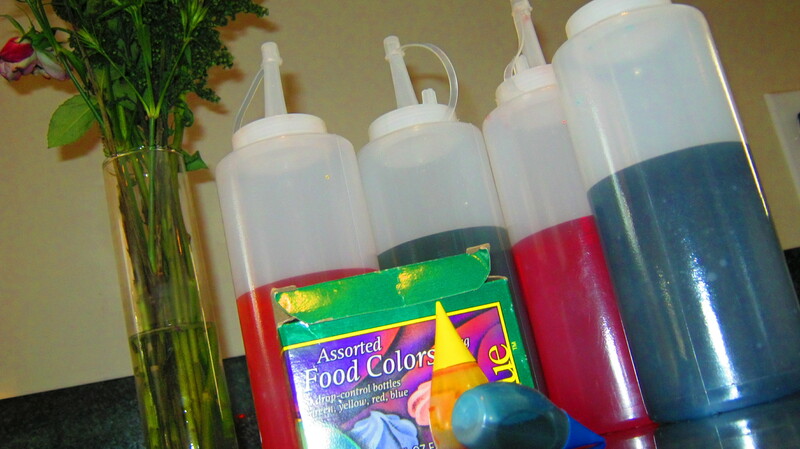 I started out with about 1/4 of the bottle full of water and eye-balled the food coloring. I probably used…8-10 drops per bottle (and that’s probably overkill but I don’t care). Then I added more water until it looked like it might thin out the color. 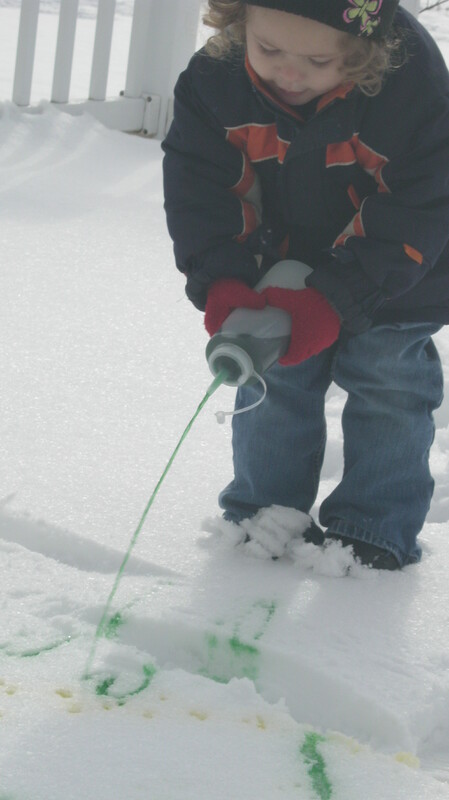 I accidentally missed getting Josiah’s face in this, but here’s a quick shot of the snow paint before it got trampled. …And the yellowish color was SUPPOSED to be orange, in my defense. Now I’m sitting at the kitchen table, typing away as the kids munch a granola bar, and you know what I’m planning to do next? 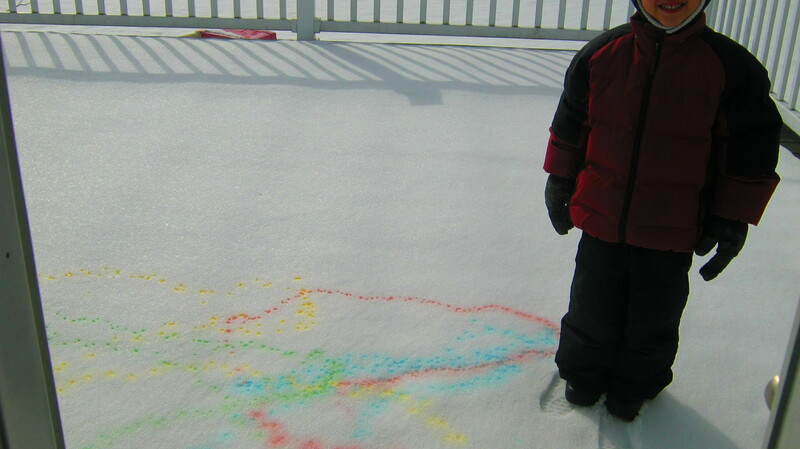 Read “Snow Day” by Ezra Jack Keats aloud to everybody while we snuggle on the couch. After that I might think about lunch. Next comes naptime–for me and the two year old. None of that is on my list. I homeschool my kids. This is a pretty passionate topic for me that I don’t often discuss at length. I think I’m still trying to temper my zeal with wisdom and not cause offense or guilt in others by my words. I would like to blog about it much more, though. Partly, I want to see my own transformation through this process. And partly, I want to share my experiences in the hopes it will help or inspire someone else to keep seeking what God has in mind for education. I will be 28 this year and my husband will be 30. Yes, we started young and no, I didn’t expect this to be my life. But I thank God every day for giving me better than I could have done for myself! I am a writer of sorts, almost exclusively a blogger at the moment because life is busy! I blog at https://verbosevictoria.wordpress.com. My husband is a subcontracting electrician and he works hard every day, God bless him. We have been given a very supportive family and circle of friends through our church, although I only know one other family attempting homeschool this year, and they plan to enroll their child back in school next year. I am in love with learning and I plan to encourage my kids to keep their love of learning as well. Feeling “other” amongst people I love has become my version of normal, and I embrace it (for the most part!) My curiosity makes me interested in just about anything, but some things I currently pursue are editing other writers, copious fiction reading, crafting, movie nights at home, studying God’s truth, dance parties in the kitchen, and learning how to be dairy-free and gluten-free when no one else in my family has to be! Our typical day is full of questions and journeys to the answers. That’s about as predictable as it gets! My kids are still very young so we don’t have much in the way of long-term projects. Most recently, I’ve been assigning myself a topic to cover with them each day–Bible, reading, writing/spelling, art/science–so that I can describe what we’re doing to family or close friends while I’m getting the rhythm down with a newborn in a couple weeks. For that purpose, we have been using a couple workbooks but normally we don’t use workbooks regularly. We use a lot of library books, a lot of online searches, and a lot of science DVDs. More than anything, though, we use conversation. We talk about EVERYTHING. My day starts early with helping Eric get out the door for work. That wakes up everyone else, so then we have breakfast. We start the day reading something from the Bible together and praying. After that, all bets are off! They love to color,,draw and design, create things with scissors and glue and empty cereal boxes. They play together quite a bit, making up storylines and dramatic dialogues. When it’s warm weather, they are outside EVERY day, finding creatures and plants to identify. A few times a week, we end up going to run errands, visit with friends, or spend time at the library. After lunch, the youngest takes a nap and I take some time to connect with the other three with a kitchen table project or stacks of books. Sometimes we get the wiggles out by dancing around the house! Then they help clean up before Eric get home. Eric wrestles with them for a bit when he walks in the door and then we get dinner going. He reads to us from the Bible before dinner, we eat, and then we usually watch something together. Then bedtime rituals and we start over the next day. To me, it means I am allowed to pursue family education in the most personalized way possible without feeling the pressure of social or relational expectations. It means Eric and I are free to hear what God is saying about each of our kids and follow through with it without distraction. It means we can be confident in our abilities as a family. I think I have always unschooled, in some sense of the word. My adventure is still brand new, but I’ve always known I couldn’t follow a hard and fast plan. We use to do more workbooks when my oldest was 4 years old, just whatever kind of preschooling busy work we could find. When she hit a wall and started refusing to even look at them, I knew something had to change. That’s when I found a name for the kind of schooling I was interested in. For two solid months, we did nothing that even resembled school WORK. I read and read and read about unschooling, talked it over to death with my mom and my husband, and worked at peeling back my own presuppositions. It was God’s timing for sure because I was starting to get bent out of shape over my oldest’s resistance to phonetic reading. Now I’m able to let her do it her way instead of making us both upset. Actually, I have been amazed that my 6 year old, 5 year old, and 3 year old have a strong curiosity about basic economics! They love learning about the value of money, how things are bought and sold, why some things cost a lot and other things don’t cost very much, how things get to the store, how we pay bills for the house, how much they would have to save to buy something they want… They soak it up! Our family is building a strong foundation of being together. I can see it being forged. It also helps Eric and I assess each of our kids individually and be more in tune with where they are as people, what they need, etc. I have also seen my kids blossom into trying new things and asking questions that reveal more about their thought processes and feelings. I think the negatives reside mostly in my own insecurity. It is hard to describe what we do to other people in a way they will understand and respect. I tend to assume judgment, even when there isn’t any, because of my insecurity. I’m workin’ on it! The other negative that comes to mind is more of a community issue–if there are other unschooling families in my area with very young kids (as opposed to teenagers), I cannot seem to find them! Sometimes my kids want to call a friend or invite them to play, but all their close friends are in school. We have a MOPS (Moms Of PreSchoolers) group we go to, but it’s only twice a month. I am thrilled any day that I know for sure I’ve paid attention to my kids enough to know we made the most of opportunities. I am disappointed any day that I feel I’ve been too lazy or too impatient with them. One thing I was proud of very recently was the collage/mosaic project we did together on a Saturday. We used all kinds of art media, tons of glue, and put them in frames to hang up in their rooms. It was awesome! That’s what it’s all about, for our family.